During my first run for the LAUSD School Board, I was interviewed by the Los Angeles Times (LAT) Editorial Board as they considered who they would endorse. Unfortunately, this discussion devolved into an argument over my support of the opt-out movement for standardized testing. I had explained that one of the reasons that my wife and I had decided to exercise our rights under the state education code and exempt our children from taking these tests was the unnecessary stress it imposed on students. A member of the Editorial Board accused me of hypocrisy as I had also allowed my children to choose to take AP tests. She was unswayed by my argument that since the payoff for undergoing the stress of taking an AP test was possibly receiving college credits, the stress of taking that test was an acceptable cost. To her, stress was a necessary part of life and she did not see a reason why children should be protected from it. To no one’s surprise, the LAT endorsed Tamar Galatzan, who was supported by the charter industry, in that election. Fresh on the heels of multiple scandals that wasted taxpayer money and exposed Superintendent John Deasy’s incompetence, the Times pushed for this incumbent who, in their own words, was “such a reflexively pro-Deasy vote that she neglected to ask key questions about problematic proposals. That includes the proposal to spend half a billion dollars on iPads for every student, which she continued to support for far too long.” Contradicting this statement, they lauded her as “the board member most likely to take independent positions”. As an example, they cited her opposition to parent centers. In that same cycle, the LAT endorsed Ref Rodriguez, even after questions had arisen over fundraising that had occurred during the early stages of his campaign. Rodriguez had been one of the founders of the PUC chain of charter schools and was also a candidate supported by those endorsing the privatization of education. After engaging in a campaign that included ethically questionable practices, Rodriguez won the election. However, he was forced from office after pleading guilty to felonies related to fundraising irregularities. As a result, the LAUSD is spending millions of dollars on a special election to select a replacement. Free from Eli Broad’s funding of their education coverage and under new ownership, the Times had the opportunity to move on from past mistakes with their endorsement in the May 14th runoff election in District 5. Instead, after noting that Heather Repenning “lacks Goldberg’s depth of experience”, they endorsed Repenning for the position. As with Galatzan, the Editorial Board used the reasoning that she was the more independent of the two candidates. I guess they missed their own paper’s coverage of the $100,000 that was donated to support Ms. Repenning’s candidacy by Los Angeles’ premier privatizer, Eli Broad. What the Los Angeles Times’ Editorial Board refuses to admit is that they are firmly on the side of the 20% of students who attend publicly funded private schools. While they complain that “the school board has become mired in a binary, reform-vs.-union way of thinking that keeps it from working collectively”, their support of charter industry-backed candidates is what has put the District in the position that it is in. It was education privatization supporters who forced the hiring of Superintendent Beutner without the backing of the entire School Board. Beutner then forced the District to endure a work stoppage that endangered the welfare of students and cost the District millions of dollars in state funding. 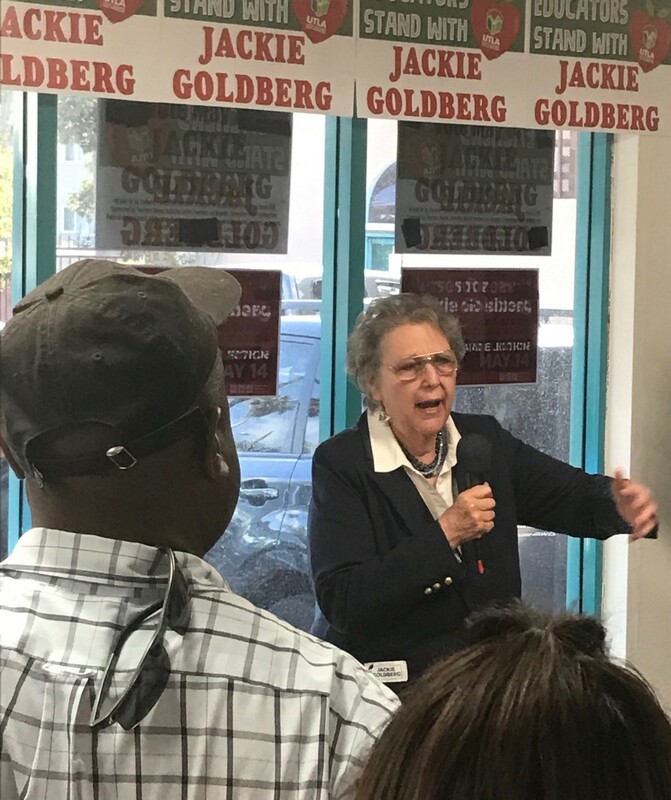 The LAT knows Jackie Goldberg is the candidate who will represent the 80% of students in LAUSD public schools. Since this threatens the privatization agenda that they support, Goldberg’s opponent received their endorsement. Jackie Goldberg is “too strong-minded to be anyone’s patsy”.